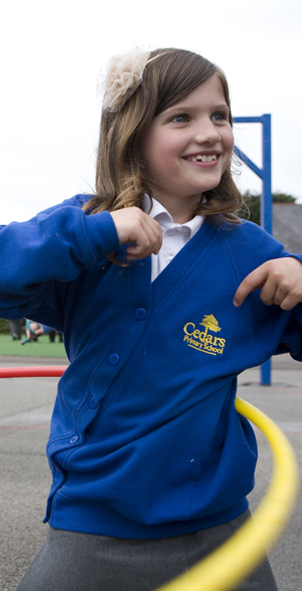 At Cedars Primary all children, staff and governors take pride in our school. We have the highest expectations for our children and work together to enable each of them to achieve the very best they can. All success is celebrated. We provide a broad, creative and enriched curriculum that extends children’s life experiences, aspirations and leads to a life long love of learning. We set high standards for attainment and progress in all areas of learning and for our children’s attitudes and behaviour. Staff and older pupils are positive role models. We provide a healthy, safe and effective learning environment in which children can enjoy and achieve. At Cedars the richness and diversity of our world and its different cultures and beliefs are appreciated, celebrated and valued. We are committed to personalised learning for all members of our community. We are committed to the continuing development of effective partnerships with parents and the wider community. We want every child to be happy, caring and successful.